Just because social media looks glamorous, it doesn’t mean that it’s only about the metro cities. Majority of the social media users are from the tier 2 & tier 3 cities and they prefer to use the social media in their native languages. It is estimated that the next 100 Mn people using e-commerce will be from small towns of India. However, when we look at With the latest Digital India initiative, it is said that e-commerce has a potential of becoming 20 trillion industry as opposed to 2 Tn now. At the same time, it is important for the digital marketing professionals to keep in mind that internet users using local languages is increasing at the rate of 47%. Nowadays, for any thing you need, Internet is a go-to medium. Right from booking a taxi to ordering food or booking a doctor’s appointment; everything is based on internet. But here’s a thing – according to IAMAI, there are around 127 Mn internet users who use internet in their local language. It also says that Hindi content on internet is growing at much faster rate than English content. This being the strongest reason, there are a few other things that highlight the use of local languages. Deeper connect with the audience. It’s a no-brainer that the brands should talk to the people in the language they understand the most. If you talk to the audience in their language, it facilitates the dialogue between both the parties. (here – the brand and the customers) When there’s a better dialogue, there’s increased trust level and loyalty towards the brand. Social media is all about popularity and reach. More the content is easier to connect to the audience, more it will get liked, commented and shared. This means increased popularity of the page. And this is applicable on every social media platform. So the content might be videos or text based content, local language makes it spread more. Recently, there was an issue regarding a riverfront resort in Goa that was harmful for the natural beauty and ecosystem. The locals created a Facebook campaign against it and used a lot of native language – Konkani so that it can be reached to a lot of people. It has got a huge popularity on social media and also forced the concerned officials to look into the matter again. We all come across various cases of women harrassment in public places / work places / transport etc that are reported by mainstream media as well as on social media by the content aggregating websites. If the women in rural areas get access to the internet and media in their local language, the help / justice for them would be just a tweet away. When there’s no language barrier, it’s easy for everyone to understand the plight too. Thus, local languages can help in empowerment. A group of mango-cultivators in Konkan recently found out about the malpractices carried by the dealers and suppliers while exporting their produce. A young farmer called out all the local people on Facebook those were settled in the metro cities / abroad and made a group from where he could directly sold the mangoes to the customers. Here, Facebook helped the local farmers to get more money and facilitated the export. After Google started offering Google Translation / Transliteration a couple of years back, now Microsoft is also introduced Bhasha – a transliteration program for Windows. 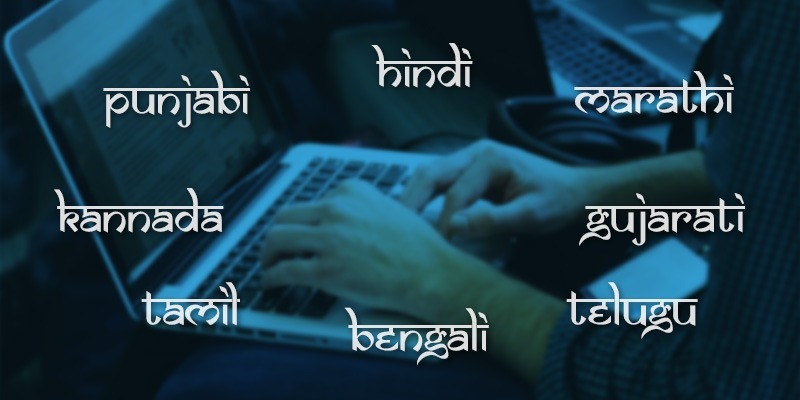 There are many groups on Facebook that have started informal learning of various languages (including the dialects) there are a number of Twitter accounts and Tumblr blogs that cater to languages. Social media helps in developing the liking towards the native languages.